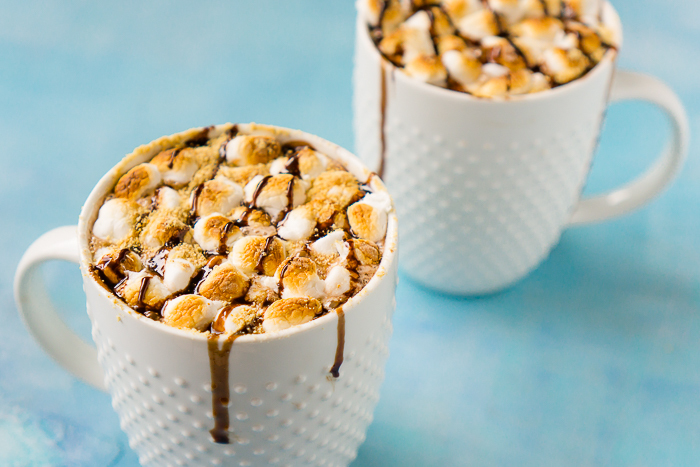 Indulge in an extra rich treat this winter season with this easy S’Mores Hot Chocolate! Rich hot chocolate topped with toasted marshmallows, graham cracker crumbs and chocolate drizzle! Rich and creamy S’Mores Hot Chocolate is the perfect treat on a cold winter day! Whether homemade or from an easy t0-go packet, I love a mug of hot chocolate on a cold night. It’s comforting, filling, and, of course, delicious! Really though, I think I love it so much because it reminds me of being a kid at home, enjoying a cup of my mom’s hot chocolate. She would always make a large batch of her own cocoa mix, and it was a consistent winter treat we could always enjoy. Loving a simple cup of hot chocolate doesn’t mean I don’t sometimes want a hot chocolate recipe with a little more pizazz though like this S’Mores Hot Chocolate! S’mores are already a big dessert win in my books, so making a s’mores hot chocolate recipe seems like an easy decision. Ooey, gooey toasted marshmallows with an extra chocolate drizzle top this tasty mug in addition to graham cracker crumbs both in and on top! It’s a perfect combination and doesn’t take much extra effort. Start by making your favorite hot chocolate recipe. I have included a simple recipe below that is always rich and creamy, but I’ve also been known to whip up these S’mores hot chocolates using hot chocolate packet as well. It all depends on how much time I have … or really, how much time I want to wait before sipping on chocolate. If you want extra graham cracker flavor, I recommend adding in about a tablespoon of graham cracker crumbs straight into the mug. As long as they are finely ground, I have never noticed the hot chocolate being grainy or anything along those lines. Instead, the graham cracker adds an almost nutty flavor, which usually comes from the molasses or brown sugar used to make them. Place a thick layer of marshmallows on top and place onto an oven safe pan. If you want your marshmallows toasted and they are definitely better toasted, you will place in the oven under the broiler for a couple of minutes. Don’t take your eyes off them. Marshmallows are quick to burn! Top off this chocolatey mug with even more chocolate and some extra graham cracker crumbs! IS THERE AN ALTERNATIVE WAY TO TOAST YOUR MARSHMALLOWS? If you don’t have a broiler or oven safe mugs, you can still enjoy toasted marshmallows on top of your hot chocolate. Purchase a kitchen blow torch instead and lightly torch the marshmallows on top for the same look and added flavor toasted marshmallows bring to this drink recipe. If you really want to taste the graham cracker flavor or if you are making these s’mores hot chocolates for guests, you could add a graham cracker rim to your mugs. To achieve the look, before adding anything else to the mug, either rub a marshmallow along the edges until sticky or dip the top of the mugs into honey or simple syrup. Then, dip the rims into a layer of graham cracker crumbs. Done! It’s a simple, easy process to make the presentation a little extra special. Quickly Whip Up a Batch of S’Mores Hot Chocolate to Stay Warm this Winter! 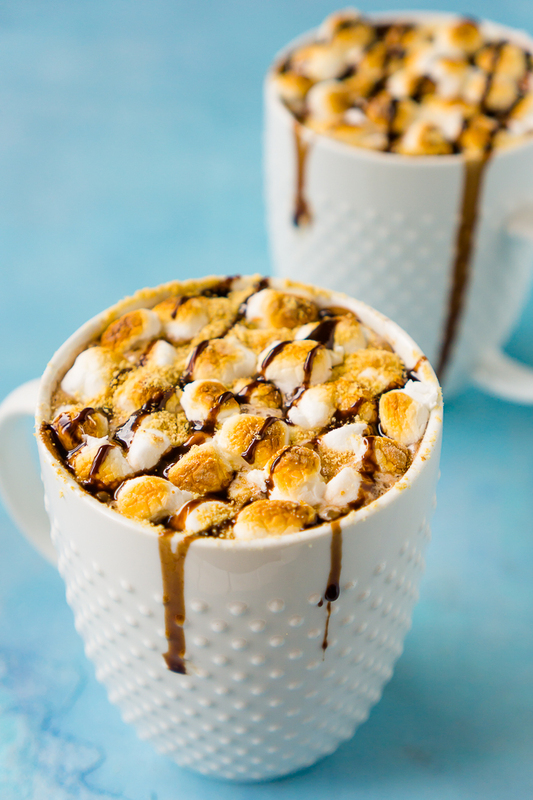 Indulge in an extra rich treat this winter season with this easy S'Mores Hot Chocolate! Rich hot chocolate topped with toasted marshmallows, graham cracker crumbs and chocolate drizzle! Preheat oven to low broil and move oven rack to the second from the top level. You want them to be high enough to your broiler to toast the marshmallows. Place a baking sheet on the rack for a sturdy surface for your mugs. Add milk and water to a medium saucepan on medium heat and warm through for about 5 minutes. You want to avoid overheating the milk. Stir in the cocoa powder, sugar, salt and vanilla and whisk vigorously until thoroughly combined. Add a tablespoon of graham cracker crumbs to each oven safe mug if desired for additional s'mores flavor! Then pour your hot chocolate into mugs and top with marshmallows and additional graham cracker crumbs. Set your mugs on the baking sheet in the oven and broil marshmallows until browned. This only takes a few minutes. Watch carefully to avoid them burning. Carefully remove from the oven with an oven mitt or towel and let sit for a couple minutes. Mugs should cool quickly for cooling. Top with chocolate sauce drizzle and enjoy!